The Australian Institute of Architects’ corporate partners provide valued programs to the architectural profession. These programs deliver a range of benefits, including diverse continuing-education opportunities and inspiration for the next generation of architects. The Institute sincerely welcomes the support, knowledge and expertise that our corporate partner community provides. Opportunities for Corporate Partnerships are currently open for 2019. With a limited number of places for a true National presence, opportunities are now open for 2019 partnership with the Australian Institute of Architects. Established in 1930, the Australian Institute of Architects is the peak body for the architectural profession in Australia, representing over 11,000 members across Australia. The Institute works to improve our built environment by promoting quality, responsible and sustainable design. Through its members, the Institute plays a major role in shaping Australia's future as our population and cities increase. There are many ways to engage with the Institute and our members. Through events and programs held throughout the country, partnership of the Institute provides your organisation with the opportunity to engage with a dedicated and captured market at regional, state and national levels. Partnering with the Institute places your brand directly in front of a dedicated receptive audience, with you selecting the optimum package to ensure strong return on investment, while creatively showcasing your brand to over 11,000 industry professionals. By aligning your brand with the Institute, you align it with the voice of authority in the architectural and design arena. Our network of passionate members gives you an unparalleled opportunity to showcase your products and services to a captive group. Directly access the most senior representatives from architectural firms from across Australia and overseas. Ensure brand loyalty and select specific membership segments you want to focus on and engage with. Generate new leads and cement established relationships through a visible presence at a range of Institute events. Take advantage of dedicated meeting, learning and networking areas to facilitate dialogue with current and potential customers. Choose from a wide range of events and programs we run throughout the year, selecting what suits you and your brand. Since 1915 the steel industry has been an essential part of Australia and its economy. BlueScope's heritage traces back to the very beginning. 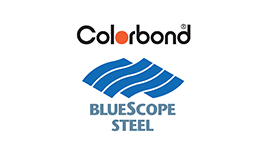 BlueScope is a global manufacturer of premium branded coated and painted steel products, such as COLORBOND® steel, ZINCALUME® steel and TRUECORE® steel. Genuine COLORBOND® steel has undergone over fifty years of Australian research and development, which has allowed for proven durability and long lasting performance when subjected to some of the harshest Australian conditions. With a range of designer colours and a new matt finish, COLORBOND® steel gives you the flexibility to realise your design vision. Dulux Australia has been supplying architects and specifiers quality coatings since 1918. From Decorative to Powder and Protective Coatings, to Texture and Timber finishes, Dulux offers a wide range of colours in high performance coatings. Dulux World of Colour brings an extensive range of inspirational colours together for designers, architects and specifiers, offering a whole new world of possibilities. With over 4600 colours to choose from, and with the release of 245 new colours, Dulux World of Colour helps make architects colour selection process easier. AWS designs, tests, extrudes, finishes and supplies the components which make up an aluminium window and door system under the Vantage and Elevate™ brands. AWS are Australia’s leading range of high performance and thermally broken aluminium window and door systems, which are manufactured through an Australian wide network of fabricators. AWS prides themselves on providing locally designed aluminium window and door suites for residential and commercial applications. By continually evolving and designing, AWS constantly maintains their reputation as leaders in the development and supply of high performance aluminium window and doors. Bondor® is Australia's leader in complete thermal building solutions and lightweight architectural panels. More than just the leading manufacturer of insulated panels, Bondor® has unrivalled experience in design assistance and construction. As Australia's only manufacturer, distributor and installer of EPS-FR cored panel, Factory Mutual Approved PIR cored panel and Factory Mutual Approved Mineral Fibre cored panel, Bondor® is in a unique position to be able to offer our customers impartial advice on the right insulated panel solution to meet their needs. USG Boral is a supplier of new and innovative wall and ceiling products and systems for the Australian building industry. A leading manufacturer in a competitive market place, USG Boral strives to deliver products that positively contribute to the design aesthetic and performance of a building. USG Boral products deliver exceptional outcomes with regards to acoustics, fire and structural design requirements. They also meet the needs of customers in the areas of ease of use, installation and efficiency. A joint venture of parent brands BORAL and United States Gypsum (USG), the USG Boral brand is seen as strong, reliable and trusted.